When I first started working in my 20s, I didn’t have interest in either cute items or elegant items. I preferred to be devious in those days. Swept up in the vagaries of fashion, I went for the minimalist look in the 90s, wearing all black and glasses though there was nothing wrong with my vision. 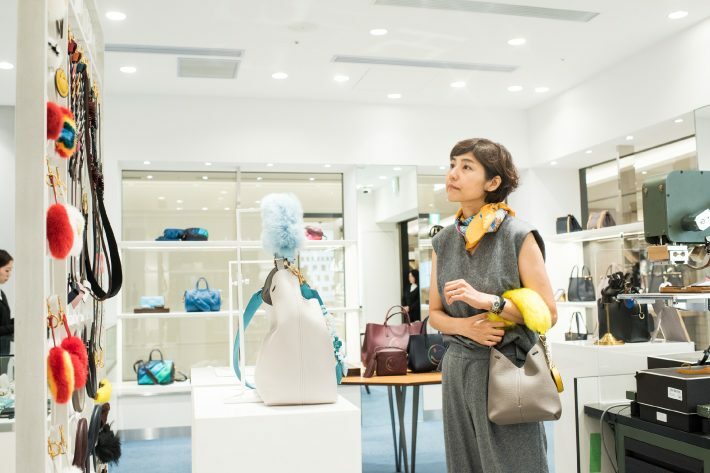 In my 20s, I avoided cute things and hardly ever visited Ginza, which I considered the bastion of conservative elegance, unless it was for work. In my 30s, I got over my resistance to cuteness and switched course to elegant mode. And then the idea of Ginza as the home of genuine articles suddenly began to resonate with me. I’d start to get excited just thinking this or that brand had a store in Ginza. I’m in my 40s now. I’ve fallen completely in love with cute styles. 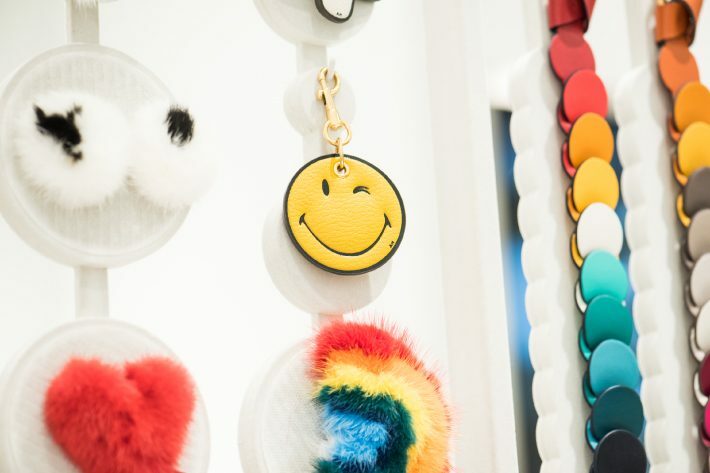 I wonder if it’s my age that’s made cute items and playful fashion look not too excessively cute and playful on me, though I still have to choose carefully to avoid tragic errors. So, for me, someone who’s experienced a late awakening to cuteness, GINZA SIX is hard to beat. No matter how pop or cute something looks, it’s naïve to think that’s all there is to it. After all, this is Ginza. It’s where grownups can go to buy genuine articles. 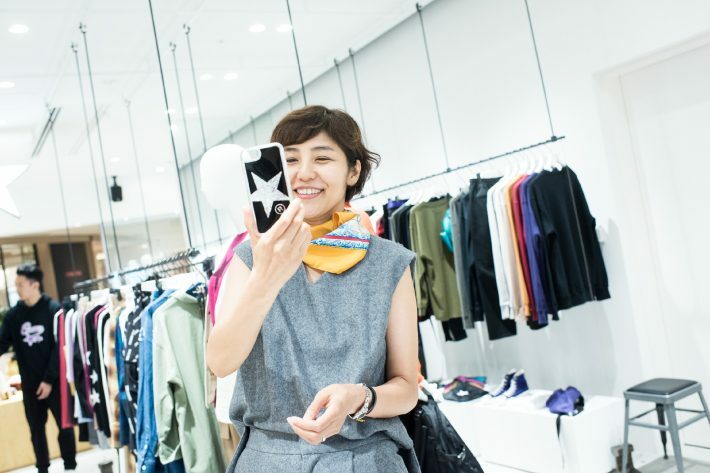 It’s overflowing with playful articles that look better on you the older you get. It gives grownups fantastic shopping opportunities. Before embarking on my hunt for cuteness, I first head to LE LABO, since what I want more than anything else right now is something fragrant. 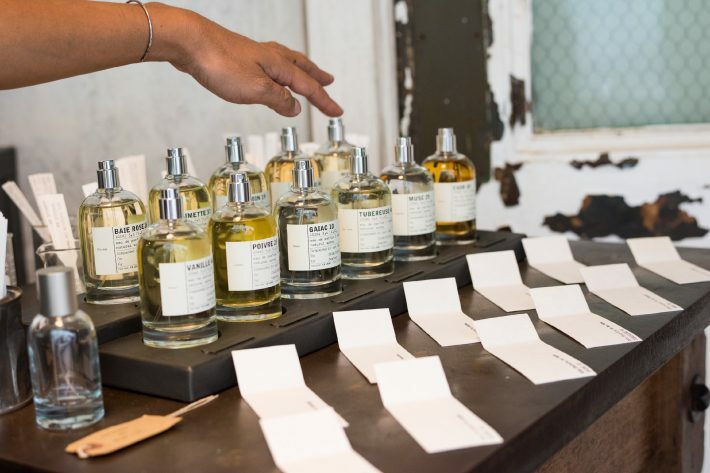 LE LABO is a fragrance brand launched in 2006 in New York City. The brand emphasizes its careful selection of ingredients. 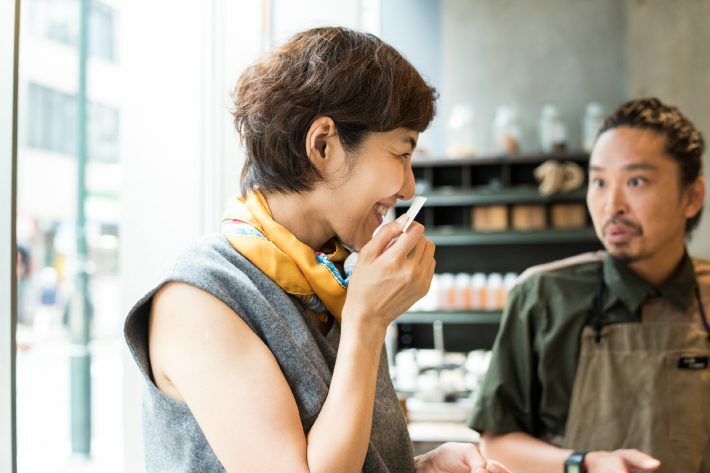 The fragrance designers seek to produce the exact scent they’re looking for, no expense spared. This means their fragrances are second to none in depth and style. 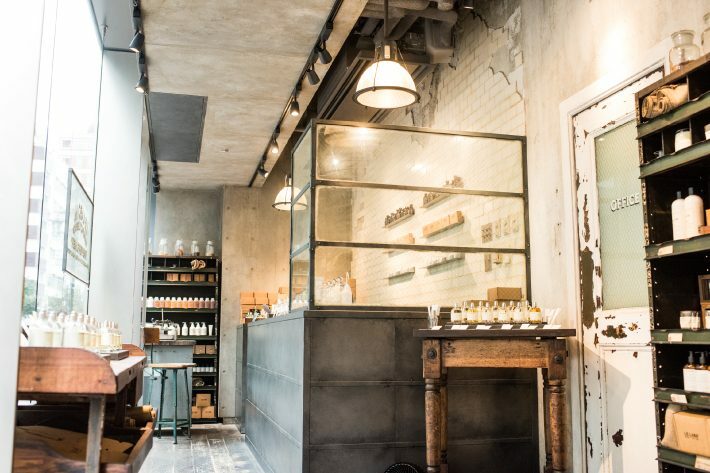 Based on the vintage chic look, the LE LABO store’s interior is really cool. 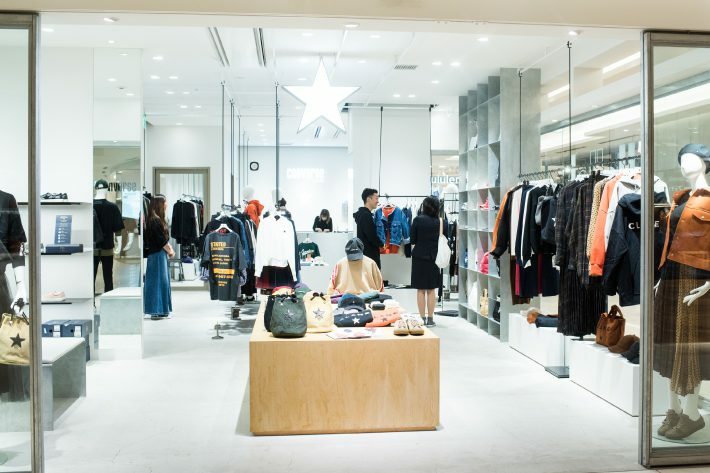 The store itself is set apart from the rest of GINZA SIX; to enter, you have to go to the Miyuki Street side. 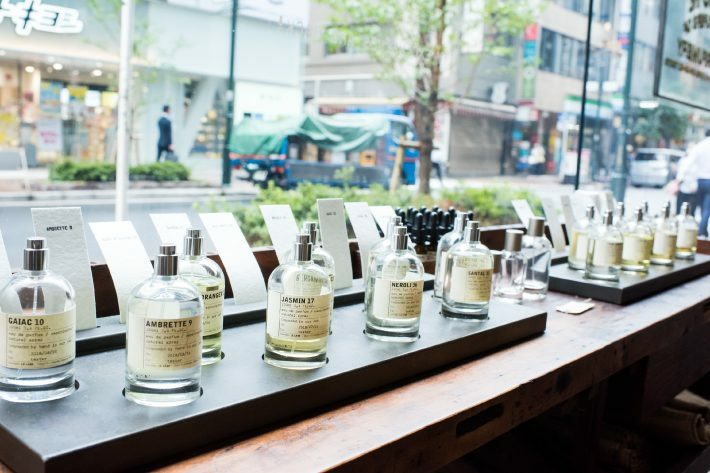 The store offers more than 10 types of perfume, including scents available only in the city in which the store is located. Also offered are products like candles and body and hair care items. I don’t like how rooms start to smell during the humid season, so I tell the staff I’m looking for a room fragrance. They have some room sprays, but I’m the type of person who prefers a mild scent in the room at all times. That, apparently, makes candles ideal, the staff recommends. He gives me detailed explanations and helps me look for the perfect fragrance. He keeps chatting as I sniff the scented candles, saying things like, “This is a spicy, powerful fragrance,” to which I say, “Wow, I feel like I’m eating curry,” and “This makes you feel as though you’re biting a fig,” to which I respond with, “Wow, you’re right!” Apparently, he himself sets out plenty of candles in his home: candles in the bathroom, candles on stools, and so forth. I feel I want to emulate this natural, effortless approach to using candles. 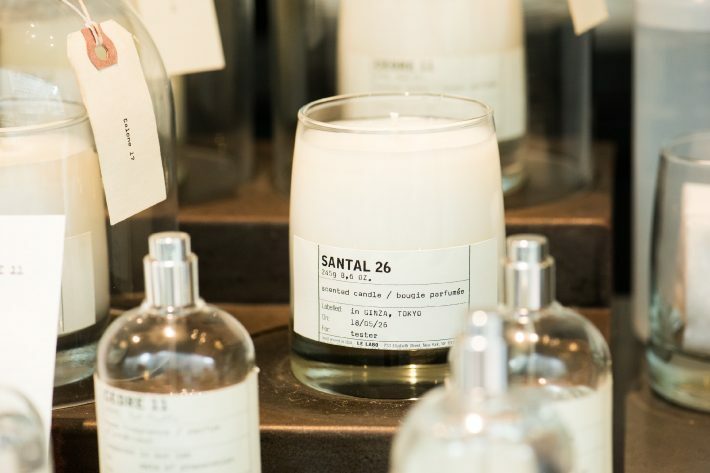 My favorite candle is the SANTAL26 (10,000 yen; all prices listed before tax). This scent’s inspired by the spirit of the good old days of the American West. While it generates a relaxing atmosphere—the feeling that you’re immersed in a forest—it also has a powerful presence. A balance between the predominant sandalwood scent and the other fragrances, including papyrus, cedar wood, cardamom, and irises, creates a nice urban feel. It’s easy to see why this scent is used in so many New York hotels. Obviously, I make my decision to buy immediately. They also include a service where they print the letters you choose on the label. I opt for my name: ERI. I’m too embarrassed to go for my initials, but this is a great little service. The label looks cute, too… It’s now a personalized item for me only, and this lifts my mood! After picking up the perfect room candle, I head to Anya Hindmarch. I’ve loved Anya’s bags for a long time. They combine a characteristic British sense of humor with a pop playfulness. I used to have a simple leather tote bag, but I haven’t been to one of the stores for quite a while. I’m overcome by all the cute items on display. 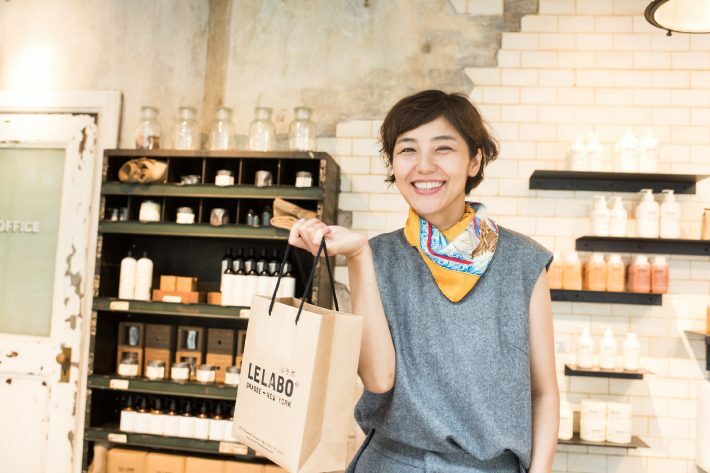 The variety of accessories for decorating bags currently on sale is especially noteworthy. The multitude of items with devastating appeal include a leather fried egg and bulging eyes made of fur. 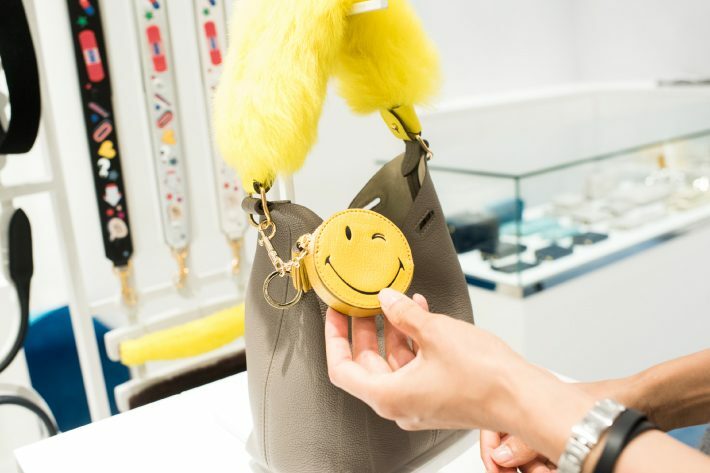 If, for example, you attach the Wink Coin Purse (30,000 yen) shown in the photo above to a simple bag like the Mini Build a Bag Base (90,000 yen) and switch the handle over to the yellow fur Shearling Handle (47,000 yen), the result looks super cute. I also love the idea of sticking leather stickers (from 7,000 yen) on the bag. 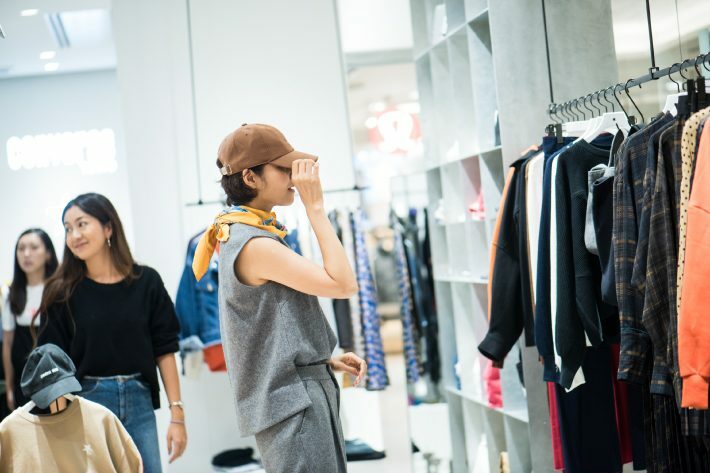 Rather than taking the serious approach and carrying an elegant bag unadorned, it’s far cooler to be bold and casualize it with pop accessories. 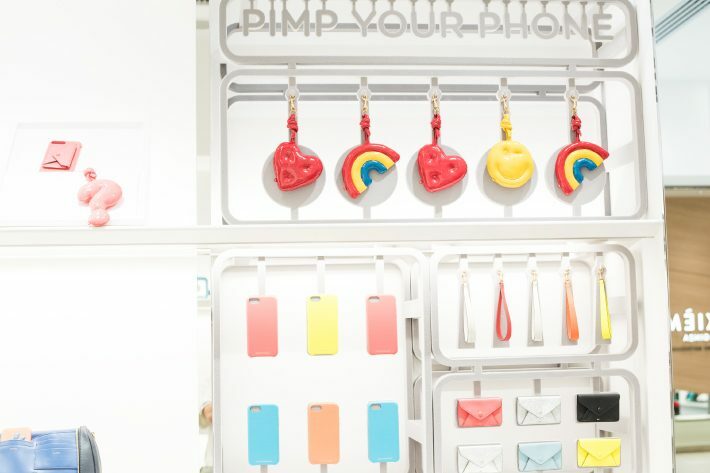 The mobile phone accessories are all large and colorful, too. Just looking at them gives you energy. The prices for the accessories are steep, but my position is that we, as adults, are free to spend our money on whatever we like. I’m almost driven by impulse to attach these accessories on top of one another. 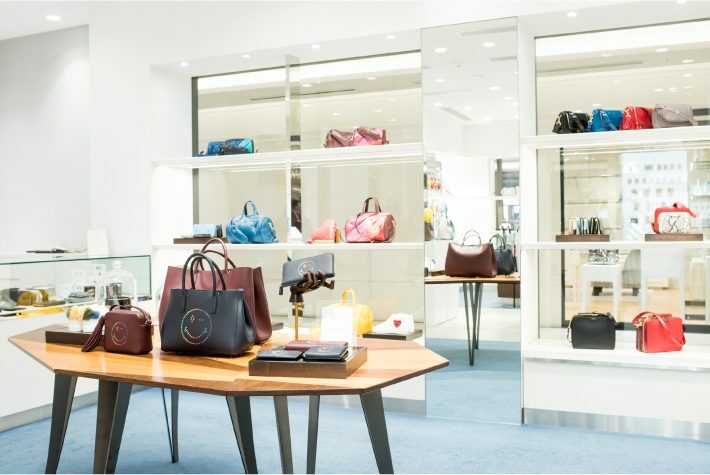 Anya Hindmarch bags are light and come with a shoulder strap and have lots of partitions inside. So their ease of use is part of the appeal. Forgive me for changing the subject, but I’ve always loved star symbols. I use the ☆ symbol all the time in letters, emails, and in Instagram posts. Stars suit both children and grownups: they can be modern, sharp, rock-and-roll, or cute. 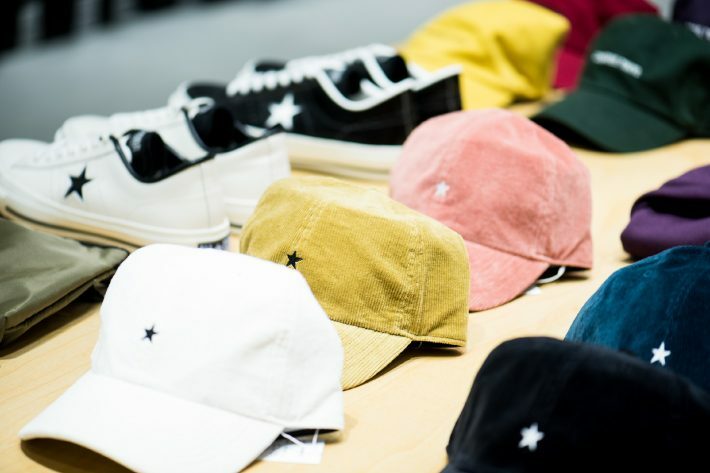 Converse Tokyo, famous for its ☆ symbol, is popular among young people, but it’s also one of my standard brands. I wear Converse All Stars around twice a week. Ultra-casual clothes like logo tees and damaged denim no longer suit me, but I still go for pop accessories. 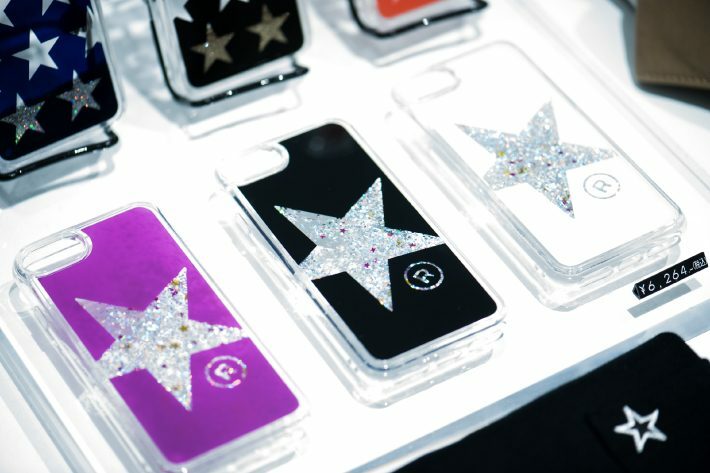 These star-patterned iPhone cases (5,800 yen) are cute, with glitter flakes in motion inside the transparent case. I keep watching the glitter as it floats around inside. Since slightly cheap-chic items are in vogue right now, this a must-buy. I like the idea of caps, but haven’t plucked up the courage to get one until now. If it’s corduroy (6,800 yen), maybe I will. The wool caps (8,000 yen), produced in collaboration with popular ladieswear brand CLANE, also have a grownup look. I’d find them easy to wear. The store staff also explains how to wear sweatshirts, which I’m not normally wild about, in a stylish way. For my next move, I’d like to go beyond accessories and experiment with wearing the clothing. My final stop is for lunch at the 72 Degrees Juicery + Café by David Myers, a Michelin-starred chef who’s a leading restaurateur in the U.S. 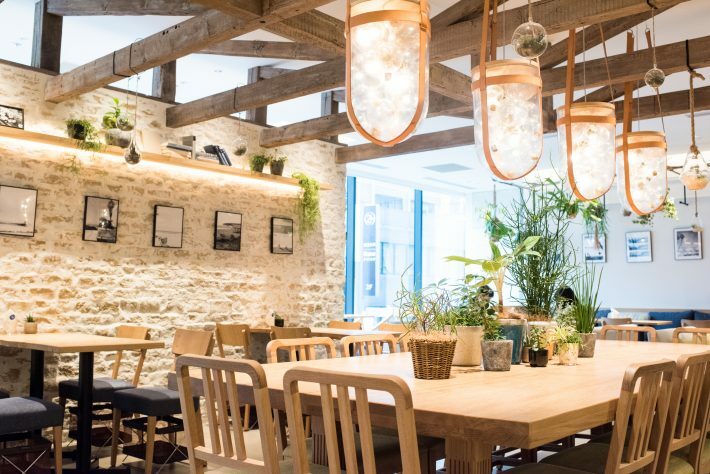 The café has an open, modern interior, where you can savor Californian-style food. 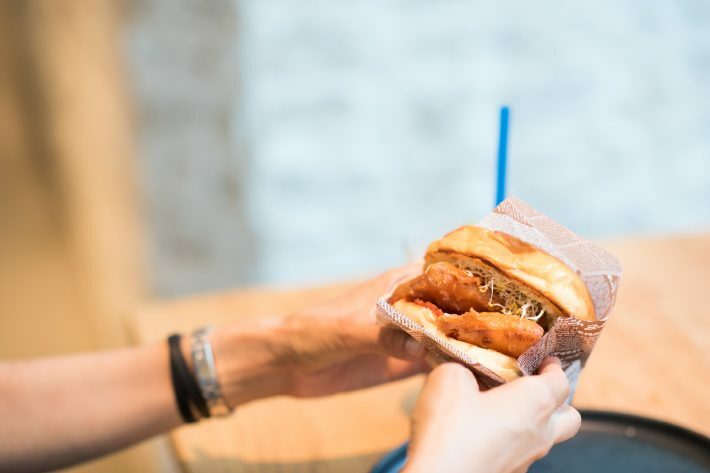 The delicious Famous David Fish Burger (1,180 yen) contains a thick and crispy slice of deep-fried white fish garnished with an original spicy tartar sauce. It’s a great burger for someone like me, who prefers fish to meat. 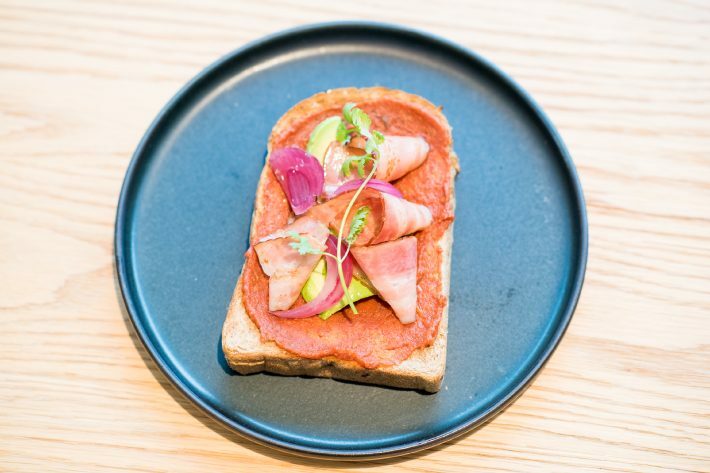 You can also enjoy an open sandwich (bacon, onion, and tomato; 1,400 yen). 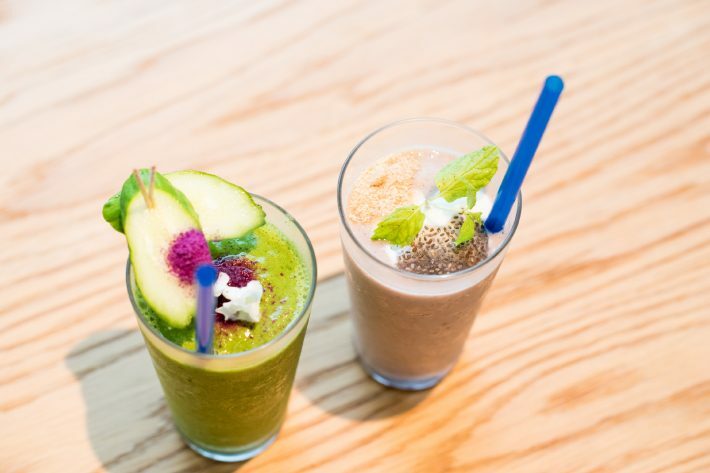 And the superfood smoothies, made from ingredients carefully selected based on proprietary standards, course through your tired veins just as superfood. They’re as close to all natural as possible: organic, specially cultivated, or wild. The large tables here offer plenty of space between the seats, so it’s a great place for meetings where you need to spread materials out in front of you. 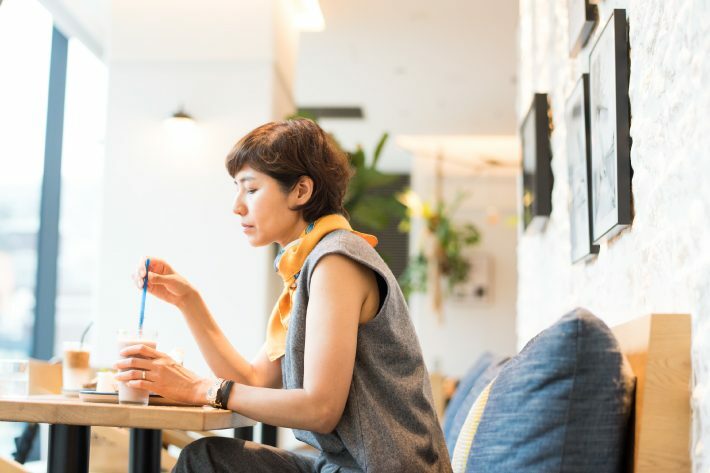 You’re likely to have some good ideas come to mind as you sip a smoothie. I find myself looking forward to visiting GINZA SIX once again soon with a girlfriend to stroll around and look for cute things.